The Drexel men’s and women’s crew teams finished the fall season strong with seven total wins at the Frostbite Regatta on the Cooper River in Cherry Hill, N.J. The Drexel crew teams finished off their fall season in top form Nov. 9 at the Frostbite Regatta on the Cooper River in Cherry Hill, N.J. The Dragons made the most of their opportunities, as they combined to take first place in seven of eight events on the day. The men’s side won three of its four events at the regatta. The men’s varsity eight crossed the finish line with a top time of 6:01.61. The Dragons were followed by Temple University and the University of Delaware’s lightweight. The Lois Krall shell featured coxswain Marc Smith, stroke Sebastian Ryan, Ivo Krakic, Marco Durica, Nicholas Capaldi, Michael DiLucca, Dave Hanrahan, Mikulas Sum and bow Vanja Busic. The men’s varsity eight “B” boat earned first place with a time of 6:03.65, outlasting Delaware, Washington College and Loyola University Maryland. Christopher Henderson guided the Vince Vidas boat, which also featured stroke Dean Hill, Xavier Stanish, Daniel Palombo, Ryan Mallgrave, Mahmoud Shurbaji, John Pieper, Grigorios Papadourakis and bow Brian McCabe. The men’s freshman eight boat also had an impressive performance, taking first place with a time of 6:47.41.The Peggy Greenawalt shell featured coxswain Jackson Beach, stroke Tom Foulds, Nico Arechabala, Louis Masi, Aengus Walker, Keegan Shannon, Joe Masgai, Peter Raux and bow Nick Herceg. The second varsity “A” boat finished close behind Temple for second place in its event. The Dragons finished with a time of 7:17.06, while the Owls finished at 6:16.05. Victoria Kenion coxed the Joseph Greipp boat, which featured stroke Christian Ladd, Daniel Dollin, Ryan McSpedon, Cameron Staines, James Byrne, Brian Kissam, Matt Gehret and bow Casimir Czworkowski. Director of Rowing and head coach Paul Savell was more than satisfied with the way the men finished out their season. He was especially pleased with how his freshman rowers performed in the spotlight. Meanwhile, the women finished their fall season in dominant fashion, sweeping their four events of the day. The women’s varsity “A” shell stopped the clock with a top time of 7:05.58, outlasting Philadelphia University and Lafayette University, who placed second and third, respectively. Catherine Hamilton guided the Marlene Buckley II shell, which featured stroke Olivia Babiec, Bridget Pfeifer, Kayla Wroblesky, Samantha Cowan, Marina Forster, Elizabeth Daugherty, Amanda Kleuser and bow Colleen Delaney. 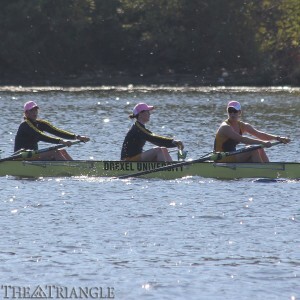 The women’s varsity eight “B” shell had another strong performance for Drexel, taking first place with a time of 7:14.00. The Maria Papadakis boat featured coxswain Sarah Messenger, stroke Victoria King, Kendall Wenzke, Taylor Brady, Elise Levito, Amanda O’Malley, Alyssa Leahy, Stephanie Thomas and bow Julie McGlynn. The Dragons finished ahead of George Mason University, La Salle University, The College of New Jersey and Haverford College. The women’s varsity eight “C” shell did not disappoint in its event, finishing with a first-place time of 7:33.90, defeating George Mason and La Salle. Coxswain Abigail Colasacco guided the Marlene Buckley shell along with stroke Barbara McKenna, Lauren Sand, Sierra Baca, Mercedes Barr, Chelsea Cohen, Christina Alleva, Crystal Xu and bow Julia Iannucci. The women’s novice four finished the day on a high note for the Dragons, as they posted a winning time of 8:47.17. The Dawn Byers shell featured coxswain Nupur Parikh, stroke Hannah Devlin, Molly Dudrear, Jenna O’Toole and bow Eugenia Chalbaud Santeliz. The Dragons head into the winter break coming off an excellent fall campaign in which they posted their best-ever finish at the Head of the Charles Regatta and showed they are a formidable program.